Discover Germany with this essential travel guide, designed to help you create your own unique trip and to transport you to this beautiful country before youve even packed your case - admire art and architecture in Berlin, walk the medieval streets of Rothenburg ob der Tauber, visit the fairy-tale Schloss Neuschwanstein, sample delicious Riesling wines in the Mosel Valley or stop off for a beer at the Hofbräuhaus - Munichs most famous beer hall. The DK Eyewitness Guide to Germany covers the must-see sights and the hidden corners, so you wont miss a thing. 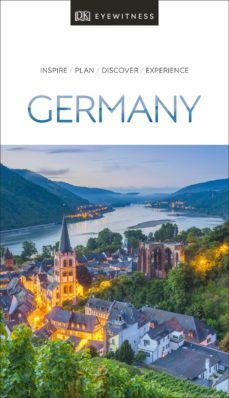 - Gorgeous, all-new colour photography so you can imagine yourself there - Reasons to love Germany: romantic castles, history, national parks, music - what will yours be? - See Germany from a different angle - 36 pages of fresh ideas for exploring the country - A year-long calendar of events in Germany gives a selection of local celebrations and festivals for all seasons - Expert advice covers the practical stuff: get ready, get around and stay safe - Over 20 detailed, colour maps help you navigate the country with ease - Expert tips to make memories that last - where to snap and share the perfect photo, take in stunning views and escape the crowds - The most authentic places to stay, eat, drink and shop - Easy-to-follow walks and itineraries take you on a tour of each region, with plenty of eat and drink stops en route. - Hand-drawn illustrations show the inside of the must-see attractions, including the Naumburg Dom, the Zwinger, Eisenach-Wartburg, Residenz in Würzburg, Kölner Dom, Schloss Nymphenburg, Residenz in Munich, Museumsinsel and Heidelberg Castle - Covers Baden-Württemberg, Bavaria, Berlin, Brandenburg, Hesse, Lower Saxony, Hamburg and Bremen, Mecklenburg-Lower Pomerania, Munich, North Rhine-Westphalia, Rhineland Palatinate and Saarland, Saxony, Saxony-Anhalt, Schleswig-Holstein and ThuringiaDK Eyewitness Travel Germany is a detailed, easy-to-use guide designed to help you get the most from your visit to Germany.DK Eyewitness: Silver award-winner in the Wanderlust Reader Travel Awards for Guidebook Series 2018. "No other guide whets your appetite quite like this one" - The IndependentOn a city break? Try our DK Eyewitness Travel Guide Berlin.About DK Eyewitness Travel: DKs highly visual Eyewitness guides show you what others only tell you, with easy-to-read maps, tips, and tours to inform and enrich your holiday. DK is the worlds leading illustrated reference publisher, producing beautifully designed books for adults and children in over 120 countries.